Pernambuco is becoming rare, especially the beautiful, dense and dark kind they had in the old days. Everybody is looking for substitutes. Sometimes Ironwood makes good bows. I have also tried Snake wood and Bania Swarzia. 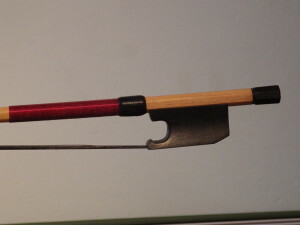 They can give good results, but the bows are different from Pernambuco bows. Lately, I found a new wood species called Camel Thorn Acacia. It comes from Africa and I got it from an anthroposophical wood dealer in Frankfurt. The wood is very yellow, like a lemon, which is a drawback of course. The wood doesn’t look very attractive, I must admit. But, looks are not everything. The stick I used has a very high elasticity, higher than any Pernambuco. And it is very dense; I would guess it is about a 1.2. That is as heavy as Ironwood, or the heaviest Pernambuco I have ever had. A friend of mine has bought a piece, too and tried to bend it, but cracks appeared all over the stick. So, I decided to use a gas flame, which is hotter than an alcohol flame. 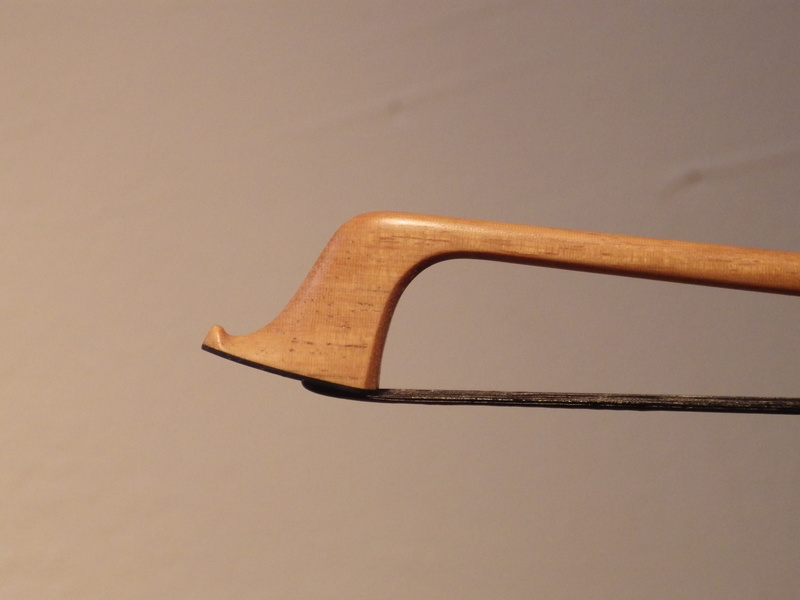 The stick warms up more quickly and has less time to dry out and form cracks. In fact it worked, no cracks at all. It could be that it just worked with this stick and with another one it would go wrong. So, maybe I was just lucky. To plane the stick was not easy. The wood wears down the iron of the plane in no time. Several sharping sessions were necessary. I left the stick extra long, 74 cm, because I figured that the wood is so elastic, it would become too stiff if it was shorter. Then I made an ebony frog and button for the bow, just plain, as they did in Germany and England. Everything went well, but when I picked it up, I felt that the bow was very heavy at the tip. What I forgot is that the wood is not only elastic, but also very dense and heavy. The balance point was at 23 cm from the frog. With hair on, the balance would move even further away from the frog and the bow would become pretty unplayable. That put me in a bad mood. The only way to resolve it was to shorten it by sawing off a piece of 4 cm, the whole mortise had to go. Now I had a stick of 69 cm, which is the length I usually use for classical bows. Of course, it was too stiff and I had to plane it down to less than a light Tourte bow. I have never made such a thin stick, and yet, it was still on the stiff side for what you would expect from a classical bow. On the tip I put a thin layer of ebony without any ivory. Some old English bows have that too, but they are not yellow. Still I think it looks kind of cool, the frog and button in black and a black lining at the tip makes sense. I decided to put black hair on it, just for the looks. 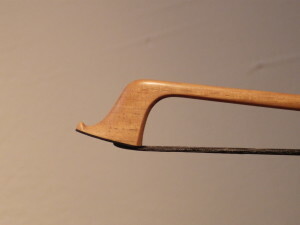 In Baroque times, they often used black hair on gamba bows. This can be seen on many old paintings. To use black hair on a violin bow is new for me, I have never dared to do that, but why not? Black hair is a little thicker than white hair. That’s the only difference. To top it off, I put a deep red silk winding on and used a small black leather grip. I couldn’t put a stamp on the bow because the wood was just too hard! To like this bow, esthetically, you need an open mind, I agree. But, personally, I am proud of it.